A glorious glacier, wild woodlands, and serene seas: the Glacier Point ATV Exploration has it all! Hop aboard a beautiful ferry ride to Glacier Point, for a stunning and exciting self-drive excursion. With only two Glacier Point & Davidson Glacier tours in existence, the Glacier Point ATV Exploration is an incredible way to see pristine, wild Alaska for yourself! Your guide will lead you across miles of off-road trails for a thrilling drive, with the majestic Davidson Glacier in the distance for stunning sightseeing. Each guest who is eligible to drive will be guaranteed at least 1/4 of the drive time, so pack your license and hang those binoculars around your neck, this is a tour you won’t want to miss! Your Glacier Point ATV Exploration begins right from the cruise docks as you board your ferry designed specifically for Glacier Point & Davidson Glacier tours. From here, a 1-hour ferry ride will take you for breathtaking views along the Lynn Canal, and remember to keep your eyes peeled for sunbathing sea lions and soaring eagles on your way! Upon reaching Glacier Point, your guides will walk you through safety and gear, before it’s your chance to hop in the driver’s seat. Behind the wheel of your very own ATV, you will navigate through miles of stunning forested trails, all the while remembering the point of Davidson Glacier tours, as the stunning glacier looms just beyond the forest. As you follow your guide, you will have plenty of opportunities to stop for photos and driver change outs, as each valid driver is guaranteed at least 1/4 of the drive time on this tour. When you finish up your Glacier Point ATV Exploration, your guide will lead you back to camp for a warm mug of hot cocoa, before you load your ferry for your beautiful trip back to Skagway. Remember your cameras and sense of adventure, the Glacier Point ATV Exploration is one you will want to remember for years to come! ATV lover? 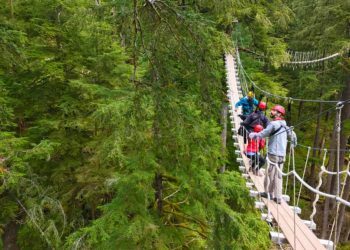 If you’re heading to Ketchikan and looking to for another self-drive experience, check out the beauty of the Tongass rainforest on the Adventure Karts Excursion. There is no minimum age to participate on this tour so long as participants are at least 50 lbs. and capable of walking ¼ mile over natural terrain. Must weigh under 300 lbs and be over 4'10" in height. Please let us know if you have any physical limitations prior to the tour. Answer: All ages are welcome to participate so long as they are at least 4'10" in height. Are there any restroom facilities on this tour? Answer: You will be able to use the restroom at the small boat harbor prior to departure from Skagway, and the outhouses located at Glacier Point near the picnic area. Answer: Anyone over the age of 18 with a valid driver's license will be able to drive.